Wilden Militaria disclaims all liability for misuse of items sold through this website. All items featured on this page are only decorative and / or collectible character, so the company is not responsible for the misuse, improper handling or manipulations that they can suffer. Imitations of knives, by the material they are made, lack edge by both sides and the firearms lack appropriate for it and have the obstructed barrel mechanisms. All items are available to be enjoyed at home, at exhibitions collectibles, or for theatrical or entertainment purposes, and always under the supervision of a responsible adult. They should never be exposed in the street, pointing them to anyone because it could cause alarm or be seen as a threat, be hidden in clothing, or left carelessly in the car. The public sale of these items conform to the regulations of free trade without being affected by the "Regulations on Arms", as is clear from the opinion of the "Permanent Interministerial Commission on Arms and Explosives" (CIPAE) dated in November 7, 1995 and the "Intervention Central Weapons and Explosives" (ICAE) of "General Directorate of the Civil Guard." PLEASE CHECK LAWS OF YOU COUNTRY. 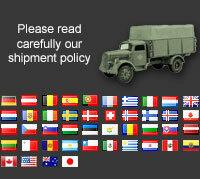 WE DON'T SEND THIS ITEMS OUTSIDE EUROPEAN COUNTRY. Submitting this form, you accept that the personal data you provide will be used by Wilden Militaria S.L. to notify when this product is available. By buying this product you can collect up to 65 loyalty points. Your cart will total 65 loyalty points that can be converted into a voucher of 1,30 €. With the sale of this material we NOT make apology of the National Socialist ideology and its political goals, or promote hatred, racism and violence. We only move the interest to offer to collectors, enthusiasts and historians, replicas of uniforms that have been part of history. Some images displayed on this page contain symbols that can hurt feelings to people or groups of people.